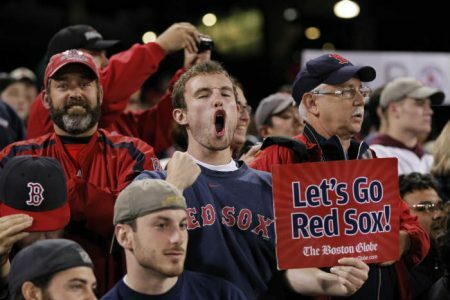 Free MLB Pick Red Sox vs. Indians from Fenway Park, Boston, Massachusetts on Sunday October 9. The Indians hold a 2-0 lead in the series after a pair of 5-4 and 6-0 wins home at Progressive Field and they could book their ticket for the American League Championship Series with another win tonight. That won’t happen just yet if we are to believe the bookmakers and the betting public as the Red Sox opened as a -135 favorite and is now at -140. Backing the Indians would pay you +130. The total is set at 9 1/2 with most of the wagers coming in on the over, despite the fact that the under is 4-1-1 in the last six meetings. Cleveland hands the ball to Josh Tomlin (13-9, 4.40 ERA) while the Red Sox will counter with Clay Buchholz (8-10, 4.78). Tomlin was briefly demoted to the bullpen, but injuries to the Tribe’s pitching staff has given him a chance to redeem himself. The 31 year old finished the regular season strong with a 1.75 ERA in his final four appearances. He is 2-3 with a 5.49 ERA in seven career games (six starts) against Boston but came up with a quality start in a tough-luck loss Aug. 15. Buchholz was exiled to the ‘pen on three different occasions, but was sharp down the stretch. The 31 year old right-hander surrendered just three runs and 11 hits in 19 innings over his final three regular-season starts. He is 2-2 with a 4.85 ERA in seven career starts against Cleveland and conceded a combined nine runs (eight earned) and seven walks in 10 innings of work against the Indians this season. The Red Sox won the regular season series 4-2 and the Indians are 1-4 in the last five meetings in Boston so perhaps there’s still hope for the Red Sox. Indians are 13-3 in their last 16 vs. a team with a winning record. Indians are 13-3 in their last 16 games following an off day. Red Sox are 9-3 in their last 12 home games vs. a team with a winning road record. Red Sox are 7-2 in their last 9 games following an off day. Over is 5-0-1 in Indians last 6 playoff road games. Under is 5-0-1 in Tomlins last 6 starts overall. Under is 12-3-1 in Red Sox last 16 overall. Under is 6-2 in Buchholzs last 8 starts overall. Both starters pitched well down the stretch, so we’re gonna go with the under for this free MLB pick Red Sox vs. Indians.